Home Unlabelled Xavi tells .. How did his mother to stay with Barcelona and not to leave for Italy? Madrid - Former Dutch coach Luis van Gaal has removed him from the Catalan side in 1999 after Josep Guardiola recovered from his injury and told him it was better to return to the restless side where he had no place in the first team. Xavi scored his first appearance in Barcelona in the 1998/99 season, and although he played only one match with the back-up team, he won a big acclaim after playing 14 games for the first team, 13 of them in the starting lineup. He also scored his first goal against Valladolid in that season to end a series of defeats that struck Barcelona and reached four league matches in La Liga, opening the way for his team to win six consecutive victories. "Van Gaal said this week I have no place in the first team and that I am here to play and that returning to the team is better than staying on the bench or in the stands. At the time, Xavi said he had received an offer to move to AC Milan, which offered him financial advantages, a job for his father and a chance to play for the first team. The veteran Spanish player said his father viewed the offer as a real opportunity, but his mother, Maria Mercy, vehemently opposed the deal. "I know someone who loves Barcelona more than I do, she is my mother," Xavi said of his mother and her strong association with Barcelona. 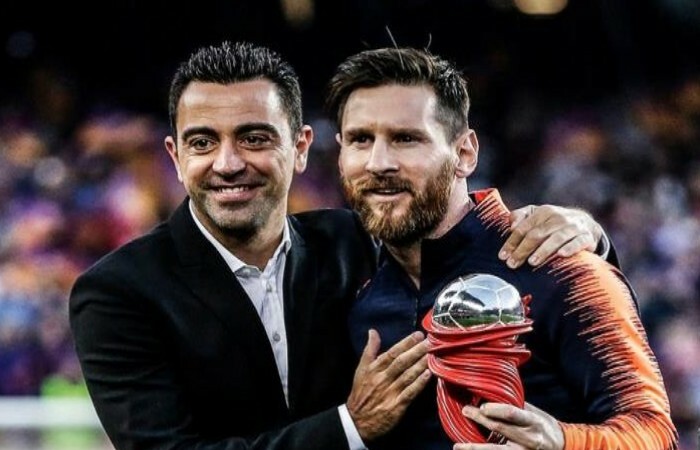 "Maybe he had to leave to develop abroad, but I was not sure about it, so my husband Joaquin threatened to ask for a divorce," Mercy told reporters after years of Xavi's offer to play in Serie A. Indeed, Xavi stayed between the walls of Barcelona and made the number 6 shirt with great glory, thanks to his mother, who refused to leave to another destination away from the Spanish club.